If you're searching for kids books online, there are numerous categories where you can focus your search. As you will discover, if you already don't know this, searching online for kids books offers far more options than piling the kids into the car and scooting off to the nearest book store or school supply store. Plus, you can often save money by purchasing high quality used books from reputable places like Amazon, where buyers rate sellers and you know ahead of time how trust worthy your seller is. Even when you have no idea of exactly what type of book you may be searching for, you'll end up finding excellent books you never knew existed. How can you beat that? Bookstores and school supply stores can only stock a limited amount of books, thus your choices are limited. Whereas online, bookstores have no limit. Here's a Google Search Box so you can search now on this kids web site or the entire Web. Here's an excellent site with lists of kids books as well as crafts and other things that may help you in searching for kids books. To expand your Search, think of a new category or type of book you'd like to explore. Type the name of the category into the Search Box above, Click the Button, and voila, you have a massive number of selections to choose from. If you're interested in health books for kids or printable activity books, here's information with links to get you started. What about online printable childrens books, some from the public domain, which are free to print up. 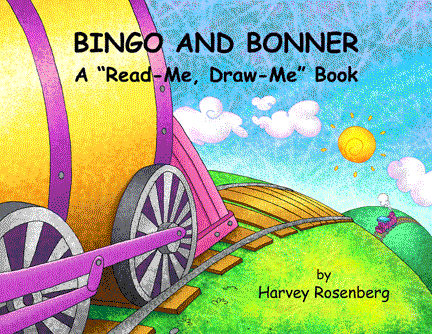 Here are sample pages, Bingo and Bonner, A Read-Me, Draw-Me Book where kids draw their own understanding of the true meaning of friendship. The information found on Searching for Kids Books is the property of Childrens Educational Books.